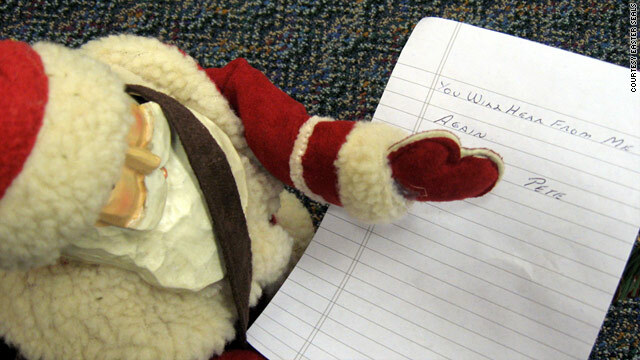 An early gift from "Pete" included a wooden Santa and note reading, "You will hear from me again." Spokeswoman says Pete is like "our own personal Santa Claus"
(CNN) -- The mysterious, but not unknown, caller phoned a few weeks ago. "'Do you know what time it is?' " he asked the longtime staffer, recalls Pam Kirk. "She recognized his voice after all these years and said, 'It's Pete time,'" says the spokeswoman for Easter Seals Rehabilitation Center in Evansville, Indiana. This year, "Pete time" meant a miniature, tin Christmas tree -- hidden between a pine tree and some Dumpsters -- with 30 crisp, new $100 bills attached. It was the latest chapter in a nearly two-decade-old story of charity and goodwill that has played out at the center, usually around Christmastime. Since 1990, the anonymous benefactor, who gives only his first name, has donated nearly $65,000 to the center. Almost all of the gifts have been preceded by a phone call and hint that a package is waiting somewhere on the center's property. "I think it gives us the feeling that we have our own personal Santa Claus," Kirk said. "It's really just the perfect example of the spirit of the season -- giving without expecting recognition in return, giving from the heart, and also making it fun." The center serves about 5,000 people with disabilities in a 30-county stretch of Indiana, Illinois and Kentucky. Fundraising typically goes toward the center's work on physical and medical rehabilitation. But Pete has always been clear that his donations should go toward extras for the children served at the center, which charges clients on a sliding financial scale and never turns away people because they can't pay. "He always says something to the effect of, use this to make Christmas merrier for one of the kids whose family can't afford it -- use it for toys, use it for clothes, whatever the kid needs,' " Kirk said. Kaitlin and Emilie Thompson, identical twin sisters who have cerebral palsy, were the first recipients of a gift from Pete. They were 4 years old when his donation in 1990 paid for a specialized chair that made showering safer and easier for them. They say insurance didn't cover the chair, and their parents couldn't afford it. "He really does embody what Christmas is all about," said Kaitlin, now 23. "He's magical. He's special -- he keeps in mind people that are less fortunate." Tim Thompson, the girls' father, said that when they were 10, they decided to open a lemonade stand in the front yard of their Evansville home to raise money for the center. It was a bigger hit than they imagined, and the girls would run the stand for another 10 years, raising about $25,000 for the center, he said. "I feel like they were inspired by people like Pete," he said. Anonymous giving is obviously not limited to Pete. It's a time-honored tradition for a number of reasons, experts say -- from religious beliefs to personal humility to merely wanting to avoid being hit up by others hoping for a donation. And while economic hard times in the United States and elsewhere have hurt giving, the Chronicle of Philanthropy said this year that anonymous giving was actually on the rise. I think it gives us the feeling that we have our own personal Santa Claus. Eighty anonymous gifts worth $1 million or more were made in the United States from June 2008 to April 2009, according to a survey by the Chronicle. That's nearly 19 percent of the 422 total during that time -- compared with the roughly 3 to 5 percent of those big-ticket donations that were made anonymously over the past decade. In a release from the Chronicle, fundraiser Robert F. Sharpe Jr. of Memphis, Tennessee, said he knew of a woman who donated $1 million to an arts center in exchange for part of it being named for her -- but then called back to ask that her name not be used. He said that in tough economic times, people who have fared well may be less inclined to show off. "Some people just don't want others to know that they shorted the market and that they now have more money than they've ever had," Sharpe said. But Pete's approach has spanned four presidencies, multiple financial booms and busts, and several generations of clients at the Evansville center. Most of the time, at least one person at a charitable institution will know who its anonymous donors are. Kirk said she and her co-workers are constantly pressed by people who think someone at the center must surely know Pete's identity. She's adamant that they don't. "A few years ago, I think our president had an inkling of who he thought it might be, and later, he found out he was wrong," she said. "Terry [Haynie, the longtime staffer who often gets Pete's calls] -- I think she has at times had ideas of who it might be, but I don't think she's ever been right, either." From his phone calls, they've figured out he lives nearby, has a wife and family, and grew up going to Evansville schools. His wife doesn't know about his donations, they say, but one person does -- and has instructions to reveal Pete's identity once he's no longer able to give. Pete has said he was close enough to watch several times as staffers went outside to find his gifts, Kirk said. But, as far as they know, no one has ever caught a glimpse of him. "Actually, we don't try -- we don't try to spot him," she said. "For him, the fun is giving anonymously. We don't want to ruin that for him." Tim Thompson, the father of the twins, agrees. While there are other donors elsewhere who give more money to other charities, there's something special about Pete's gifts, he said. "He's gone beyond his monetary donations," Thompson said. "He's changed people's outlook on life."